"Transformers: Age of Extinction (or simply Transformers 4) is a 2014 American-Chinese 3D science fiction action film based on the Transformers franchise. It is the fourth installment of the live-action Transformers film series and a stand-alone sequel to 2011's Transformers: Dark of the Moon, taking place five years after the battle of Chicago. Like its predecessors, it was directed by Michael Bay and written by Ehren Kruger, with Steven Spielberg and Bay as executive producers. It stars Mark Wahlberg, with Peter Cullen reprising his role as the voice of Optimus Prime, as the lead roles. It is the first film in the series to not feature the original human characters from the first three films, but features a new cast of human characters and many new Transformers, including the Dinobots. Returning Transformers include Optimus Prime, Bumblebee, Ratchet, Leadfoot, Brains and Megatron (now known as Galvatron). The film was released on June 27, 2014, in IMAX and 3D. It received an average rating of 18% on Rotten Tomatoes. It also received seven nominations at the 35th Golden Raspberry Awards, including Worst Picture and Worst Prequel, Remake, Rip-off or Sequel, with Bay and Kelsey Grammer winning the awards for Worst Director and Worst Supporting Actor respectively. However, many praised the visual effects, the action sequences, Steve Jablonsky's musical score, and the performances of Wahlberg and Tucci. Despite the poor reviews, the film was a massive box office success. 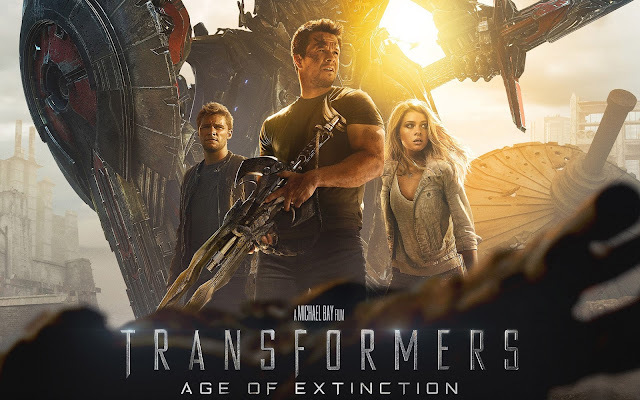 The film grossed over $1.104 billion worldwide, making it the highest-grossing film of 2014, the second highest-grossing film in the Transformers series, the 19th film to gross over $1 billion, and the 16th highest-grossing film of all time. It is also the only film to gross over $1 billion in 2014. A fifth film, Transformers: The Last Knight, is set to be released on June 23, 2017, with Cullen and Wahlberg returning and Bay directing again. A sixth film, serving as a Bumblebee spin-off, is scheduled for a 2018 release and a seventh film, Transformers 6, is scheduled for a 2019 release and will serve as the sixth main entry in the series." "Sixty-five million years ago, an alien race known as ""Creators"" invade prehistoric Earth, wiping out most of life on the planet with ""Seeds"". In the present, the public has become fearful of Transformers following the Battle of Chicago and the U.S. government has terminated all joint operations with the Autobots. Cemetery Wind, an elite CIA black ops division formed by Harold Attinger, was requested to destroy the remaining Decepticons. However, they have also been hunting down Autobots, believing that all Transformers are a threat. Aided by Cybertronian bounty hunter Lockdown, Cemetery Wind tracks down and kills Ratchet, who refuses to expose the whereabouts of Optimus Prime, whom Lockdown wants alive. In Texas, financially struggling inventor Cade Yeager and his friend Lucas Flannery discover an old truck in an abandoned theater and buy it to repair and sell it for Cade's daughter, Tessa, and her college funds. Cade discovers that the truck is an injured Optimus and revives him. Having tracked them down, Attinger's right-hand man James Savoy leads Cemetery Wind to the Yeagers home where they the family and Lucas just before Optimus rescues them. Cade, Tessa and Lucas escape with Tessa's secret boyfriend, Shane Dyson, but after a lengthy chase, Lucas is killed by Lockdown's grenade. Optimus rallies the remaining Autobots, Bumblebee, Hound, Drift, and Crosshairs in the desert. Using a spy drone he took during the attack, Cade learns of Kinetic Solutions Incorporated (KSI), a technology firm partnered with Cemetery Wind, and the Autobots decide to infiltrate KSI headquarters in Chicago. Meanwhile, Joshua Joyce, KSI's founder, reveals he has imprisoned Brains to decode dead Transformers' minds for raw materials and utilize their data for human-created Transformers. The Autobots storm KSI, but Joshua stops them, proclaiming they are no longer needed. Disillusioned, the Autobots leave the facility. Forced by Attinger, Joshua launches prototypes Galvatron and Stinger, created using data from Megatron and Bumblebee, respectively, to pursue the Autobots. Optimus fights Galvatron, who becomes autonomous due to Megatron's influence, but the fight is cut short when Lockdown disables Optimus, capturing him and Tessa; Lockdown reveals that the Creators want Optimus back. Lockdown moves his ship into downtown Chicago to give Savoy a Seed, allowing the Autobots to board the ship and rescue Optimus and Tessa, escaping using a detachable part of Lockdown's ship. Meanwhile, Joshua decides to retreat to China for production facilities. Optimus explain to Cade that Galvatron is actually Megatron, who has been plotting to steal the Seed so he can rebuild his Decepticon army. Cade contacts Joshua and warns him about Galvatron and Attinger. With a change of heart, Joshua betrays Attinger after knowing of the latter's true intention. Elsewhere, Galvatron activates himself and infects all KSI prototypes into Decepticons. Joshua flees with the Seed to Hong Kong, with Attinger and Galvatron chasing after him. When the Autobots try to retrieve the Seed in Hong Kong, their ship is shot down by the Decepticons. Cade and Savoy fight, which ends in Savoy falling to his death. Optimus releases and tames the Dinobots, who assist them in fighting the Decepticons. Afterwards, Lockdown returns and confronts Optimus. When Cade arrives to help Optimus, he is held at gunpoint by Attinger, but Optimus shoots and kills Attinger. Lockdown then impales Optimus, but Tessa and Shane free him while Cade and Bumblebee distract Lockdown. Once freed, Optimus kills Lockdown, while Galvatron retreats. They reunite with the other Autobots, and Optimus sets the Dinobots free. After asking the Autobots to protect the Yeagers, Optimus flies into space with the Seed, sending a message to the Creators that he is coming for them."